Penguin parts – for building a wooden Penguin. I inherited some Russian Red Cedar ribs for both Penguins and Windmills, along with some Sitka Spruce Mast/Boom stock, Russian Red Cedar Penguin Transom, Assembly Templates and classic s/stl hardware. Material is located in Highlands, NJ. Prices are negotiable. TNT was raced by Len Penso in the Chesapeake Bay region for many years. Richard Mueller purchased her from Amy Krafft in 2007. Amy arranged shipping from Chesapeake Bay to the Eugene, Oregon Yacht Club with Thistle sailors going to their Nationals. Kurt Mueller transported TNT to Coos Bay, OR. Richard & Marilyn Mueller brought her to Phoenix, AZ. TNT, trailer and sail are in excellent condition; always "garaged". Only sailed in local fresh water lakes - Lake Pleasant & Tempe Lake. The trailer license in up to date. Boat purchased new by my father in the 1970's from Vince DeMaio, a family friend and founder of Customflex. 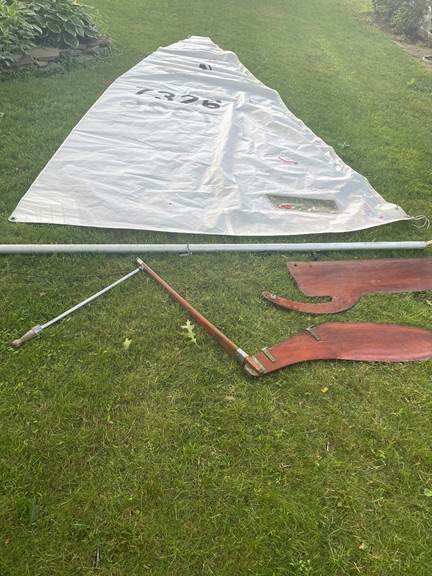 Customflex Penguin -1971 Penguin plus trailer (including mast boom sail, cover, and parts) for restoration or for parts to help complete another boat. $400. I am seeking the whereabouts of Penguin 1947.
from the Fishing Bay Yacht club, near Deltaville. see if the current owner might be willing to sell it to me. Stiff and fast with buoyancy bags, eight to one vang and two to one cunningham. Vang and cunningham double ended. # 7439. Built in Philadelphia by John Wright, Jr, 1960’s. Interior finished bright. Original sail. Wooden mast and boom in good shape. Hull painted navy blue with Interlux paint. 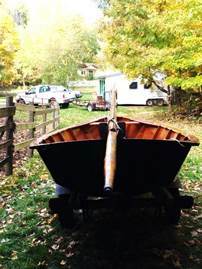 $800.00 for boat or $1050.00 with trailer. Wanted: I am searching for a Penguin rudder. Mine split in half. Also looking for wooden spars for the sail. Any information would be amazing! Penguin #4474 with papers. She is in need of work, but has plenty of extras including all hardware to hang on a garage ceiling. The hull needs to be wooded down and repainted. I have a good Dacron sail, plus brackets for holding mast and boom while trailing. I do not have a trailer any more. Description: Wooden penguin in decent shape. Stored inside for the past 4 years. Equipment: Main sail, aluminum mast – Proctor alpha section, 2 rudders, trailer, rig and all hardware, top and bottom cover. 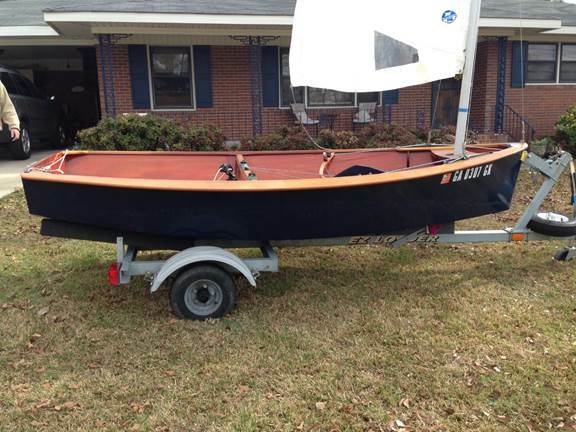 Unnumbered Modern Penguin – Self Rescuing wooden boat located in Macon, GA. $2225. I also have an EZ Loader galvanized trailer and 2.5 HP Suzuki outboard (2015) as well as complete boat covers for the Penguin. Covers are included, but the trailer and/or motor are available for an additional cost. 5524 (possibly). 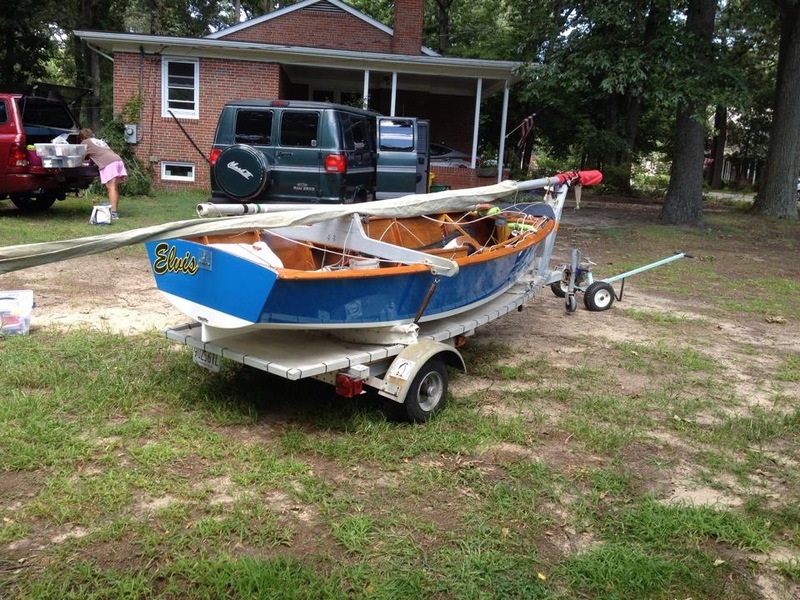 Comes with an old trailer that looks like it was slightly modified to carry this particular boat. Trailer is highway ready with working lights and decent tires. 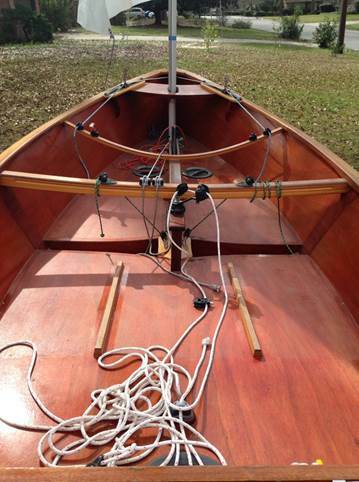 One of the turnbuckles and the oars are contemporary. Some carabiners were used to attach the sheet but other than that, it looks like nearly all of the fittings are original, patina'd brass. There is some minor leaking from somewhere, probably the pivoting centerboard casing. At some point somebody used everyday latex paint on the bottom (blue in the photos) which did not fully seal the boat. Boat is 100% sail-able and towable as is. Boat is currently garaged in Marquette, MI. Rudder (Blade is intact –tiller from hinge forward broken. Pintles and gudgeons, intact. 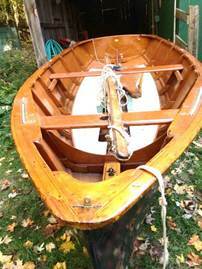 Boat is sold as is and contains no warranty If interested, call Trudy at the Door County Maritime Museum between 9 am - 5 pm, (920)743-5958. Door County Maritime Museum & Lighthouse Preservation Inc.
Penguin 9275 Self-rescue design wooden Penguin. 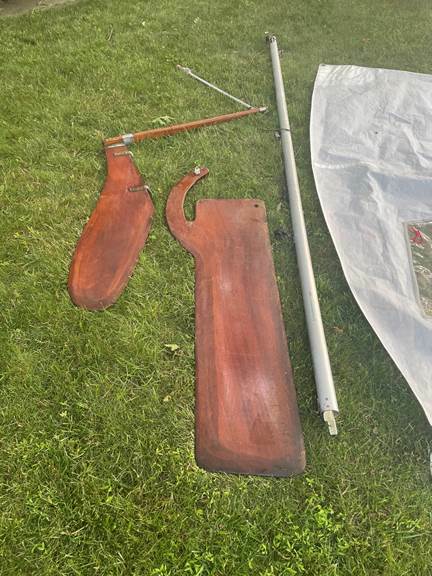 3 Sails, 1 New (2 regattas), New aluminum Mast, new rigging, sheets, side stay tracks, blades in good shape. On a Trailer, good for yard use. $750. Penguin class sailboat. Length 11'6", beam 5". Cat rigged dinghy-type centerboard sailboat. Fiberglass hull, Aluminum mast, wooden boom, all rigging intact. Sailable as is. New paint and new floor board would be good. Trailer has some rust but is in good condition with new wheels, tires and bearings. Great day sailer $600. The manufacturer was Roberts Industries of Stratford, Connecticut. The sail (hull?) number is 7409. 1975 fiberglass Penguin, custom-made by John Morgan (Morgan Yachts). 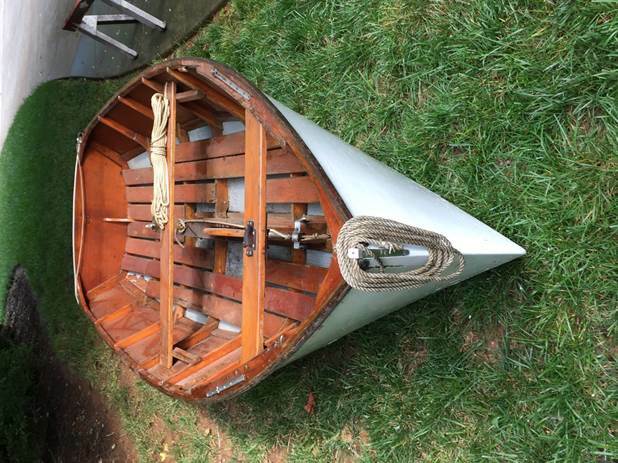 It was purchased and has been kept in Knoxville.Comes with full rigging (all in good condition), one set of oars, one set of paddles. 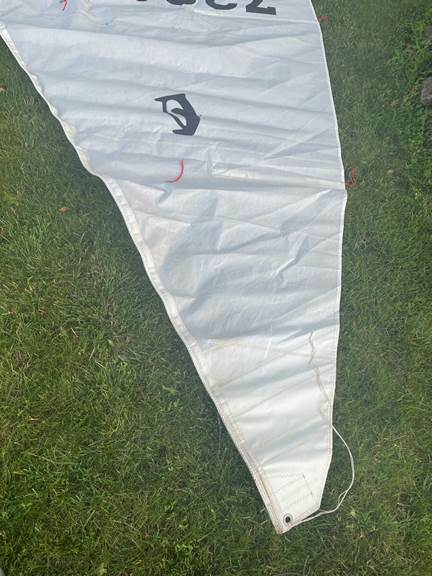 One sail in good condition.Asking price: $1,200. Does not come with trailer but we can also deliver to your house/dock if you live within a reasonable distance. Please email schonagen@mac.com with questions and thanks for looking at the boat! Penguin (built ~ 1968) located in Santa Ynez, CA classic wood Penguin Class sailboat with sail and rigging. Oars. Trailer is shot so you will need your own trailer which is why my price is low. 9744 Innovator Fiberglass Penguin – Self rescuing design. With trailer. $850. Pat FitzGerald decided to sell his Freedom Boat.. Pat's boat is pink(don't let that bother you it is fast and can be painted). 9693 probably not sailed since 2000 built 1989. $3,500. 9749 We’ve sailed the boat one time since I bought it at the Chesapeake Bay Maritime Museum auction on August 30, 2008. The boat and trailer have been stored indoors the entire time. This boat, Tuxedo Junction, No. 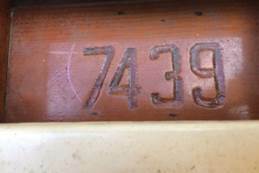 9749 was built by Jerry Mullins, Norfolk, VA and measured and certified in 2003. The boat was built in strict accordance with I.P.C.D.A. specifications. I would like to sell the boat and trailer for $3,500.00. This is what I paid for it at the auction. If you know of anyone interested in a very lightly used Penguin, please have them contact me. Beautiful 1962 wooden boat. Penguin class. Length 11`5``, beam 4`8``, sail area 72 sq. ft. Comes with trailer. $1,700.00. Cash only. Call for appointment to see. 330-309-0861.